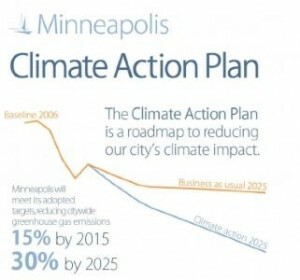 On June 28th, 2013, the Minneapolis City Council approved the Minneapolis Climate Action Plan (MCAP), which included key environmental justice recommendations. A landmark achievement occurred when Environmental Justice representation on the Steering Committee and the formation of an Environmental Justice Working Group (EJWG) was added to the City’s climate planning process, after a year-long organizing effort. CEED’s Director of Research Programs, Dr. Cecilia Martinez served on the Steering Committee, and Executive Director Shalini Gupta facilitated the EJWG and its policy recommendations, along with the core leadership team of Lea Foushee (North American Water Office) and Sam Grant (Afro Eco). The EJWG held several meetings which included a diversity of representation, from across Minneapolis neighborhoods and communities. The MCAP environmental justice recommendations are guided by climate justice principles, which seek to address racial, social and economic disparities, and promote a more equitable and just process for future climate planning. The EJWG engaged in a rigorous scrutiny of recommended strategies proposed by the three other Working Groups (Buildings & Energy, Transportation & Land Use, and Waste & Recycling) and provided critical modifications to move the plan toward a more inclusive and equitable set of strategies. Through our work on the Minneapolis Community Environmental Advisory Commission, we will monitor the list of priorities from the Climate Action Plan being developed by the Office of Sustainability, as well as theEnergy Vision and Pathways Study the City has just commenced. Our goal is to advocate for broader community input and inclusion of racial and economic equity/justice indicators in the City’s environmental planning. In conjunction with CEED’s efforts to inform policy makers to address environmental justice in climate action plans, CEED continues with its efforts at the State level where in March of this year Executive Director Shalini Gupta spoke on the Climate Panel at the Environmental Quality Board’s Minnesota Environmental Congress. CEED also met with Minnesota Pollution Control Agency Commissioner Stine and several staff to discuss how to implement environmental justice into state regulatory processes.